Lewis Hamilton (1st, 1:18.259): "The day was pretty good, but it was a tricky one because it was so windy out there. Every driver was struggling with the changing direction of the wind. You're constantly arriving at each corner and the wind direction is never the same, so we saw lots of drivers going off. These conditions make it very difficult to define where the set-up needs to go. We got through all our running and were quite fast compared to previous years. We've got some work to do overnight, I'm hoping that it's cooler and calmer tomorrow. I think it is going to be relatively close between the top three teams but I can't really say who is quickest at the moment." Valtteri Bottas (5th, 1:18.611): "It's been a good day overall. FP1 was especially promising, the car felt good from the start. We made some changes for FP2, which didn't improve the car, so we reverted back to the original set-up. Today has been a good start to the weekend, but things can change quickly from Friday to Saturday especially since Ferrari and Red Bull looked quick today. I didn't really feel any gain of grip with the SuperSoft compared to the other tyres, so we will have to work on this area for tomorrow." Andrew Shovlin: "It has been a productive day with both cars running reliably and completing their respective programmes. Conditions haven't been especially easy, the wind has been strong and unpredictable which caught out both our drivers on their SuperSoft laps but we weren't the only ones who seemed to be struggling to get all the sectors together. It was difficult to know quite what to expect with the tyres here as the conditions in the winter were so cold, and it is the first time we have run the thinner tread Pirelli tyres. For this reason we spent more time than usual trying to understand how all three compounds compared to make sure we carry good information into the race. Our car worked very well here in the winter but we've seen in the early races that both Red Bull and Ferrari have added a lot of performance and that was also evident today in their performance today. We do need to find a bit of pace, especially on the SuperSoft tyre given that qualifying is so important here, but the car wasn't perfect today so hopefully we can make a bit of progress overnight and give Red Bull and Ferrari a tough time tomorrow." Daniel Ricciardo (2nd, 1:18.392): "It was a day of two halves. The car felt pretty different this afternoon and I think that showed. The mistake in to Turn 4 this morning was a costly one and I missed the final hour of the session because of it. Tail winds are a big thing in F1 and in any corners with a tail wind you lose a lot of rear grip. Turn 4 is a bad corner to have a tail wind and it caught me and a few others out. Of course you don't want to crash but if I'm trying to find a silver lining, then FP1 is probably the best time to do it. FP2 is the one where you do your Race and Qualifying simulations. We got our heads down and put the laps in this afternoon, which was important with the updates to the car, there are quite a few aerodynamicists here today so we needed the laps to give them as much feedback as possible. On the soft tyre we were quite fast, we didn't really get the supersoft working which I don't think many people did and it looks like it will be a tricky tyre this weekend. At the end with high fuel I think we were ok but I'm sure we can still be better. We have found some pace, there is still a bit more to find, but overall a pretty good end to a Friday." Max Verstappen (3rd, 1:18.533): "You always want to improve but I think the car has been handling pretty well today. We didn't experience too many issues and it looked competitive in the long runs. FP2 and FP3 looks good for us on paper but it is only Friday so we'll keep pushing tonight to make some steps forward for tomorrow. The updates we brought here seem to be working so we will have to wait and see how much of an impact they have on Qualifying. The supersoft tyre doesn't seem to be particularly quick and is hard to get working, that might change tomorrow but the soft seemed a better compound today. The new surface created a few moments for a lot of drivers, myself included. A few corners are now flat out which means we lose a bit more time as it effectively makes the straights longer, but we looked competitive in the last sector so we can make up for it a bit there and play to our strengths. Short runs were decent and long runs looked good so come Sunday I feel we can perform well and have good pace. It is tricky to overtake here so hopefully we can put ourselves in a good position for Qualifying tomorrow." Sergio Perez (10th, 1:19.962): "I think we've made a lot of progress throughout the day. We have some good information and we have learned about the new parts on the car; we have made a step forward. The balance is still not ideal so there is the potential to find more performance tomorrow. The track was very green this morning, but it improved this afternoon even though it was very windy." 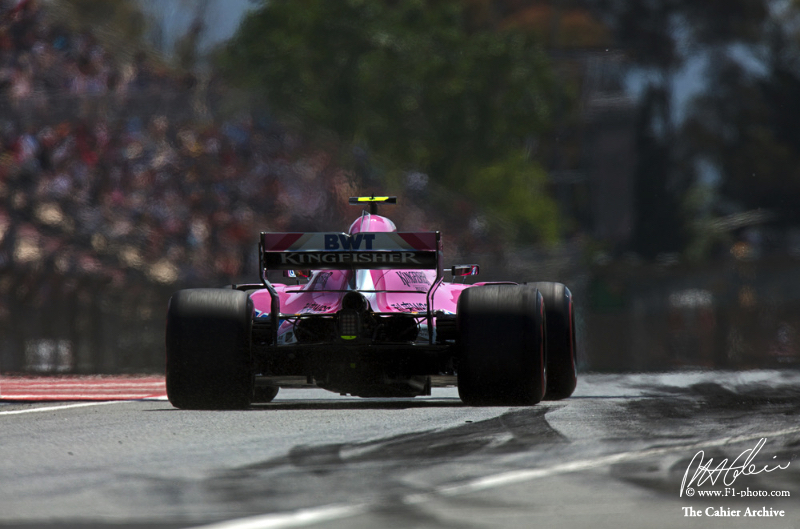 Esteban Ocon (11th, 1:20.024): "It was a solid day and a big effort by the team to try so many different things on the car in the first session. We managed to complete most of the big jobs and now we need to do more homework to understand everything. I think there is still a lot more to come because we are not exactly where we want to be with the car. Track conditions were not easy for anybody because it was very windy and difficult to put together a clean lap and stay on the track." Otmar Szafnauer, Chief Operating Officer: "It's been a productive start to our weekend, despite some tricky conditions. Our work today was mostly aimed at evaluating new aero parts – floor, barge boards and front wing – as well as gathering data about the tyre compounds. The wind was reasonably high and it caught a few drivers out but we managed to collect all the critical data we needed to help our preparations for the weekend. There was a small problem with Sergio's left front wheel at the end of the session, the cause of which we are investigating, but it only cost us a minimal amount of track time. We are in pretty good shape ahead of the weekend with plenty of data to analyse tonight so that the team can make the right decisions for qualifying and the race." Lance Stroll (19th, 1:21.556): "I didn't really run this morning, as I went off on my second push lap so it was not the morning I was hoping for. It was very difficult to understand the balance as it's definitely not the balance a racing driver wants to feel. This afternoon we tried to sort out a few things and the car improved a little bit, but still there is so much to understand and figure out. There is a lot of work to be done tonight and we have got to understand what to do so we can be better." Sergey Sirotkin (20th, 1:22.060): "The car is difficult to drive, and mentally it makes you concentrate 200% on everything because it's so tricky. You saw this morning how difficult it was with cars going off. It takes a lot of energy from you just to drive. We didn't expect it to be easy and I'm waiting for the chance to test most of the new bits on our car. Yes, that was a bad session, but we have a long-term plan with a lot of effort from all of us, so I don't want one bad session or event to affect it. Everyone is working flat out and it will take time, but we will get there." Robert Kubica: "It is a good feeling – not so much from being in the car but from before that, because I'm back driving in an official session, even if it's only FP1. It's the first time since the end of 2010 so there's some emotion, but this disappeared very soon as we have quite a difficult car to drive. The balance was quite off, but somehow we have to stick to what we've got to complete our aero tests and evaluations. It wasn't an easy session, but we managed in difficult conditions and I was able to give some good feedback. When you're struggling so much it's difficult to enjoy it, but still I'm happy because I think the most difficult car we've had was in this session and I managed to stay cool, and somehow extract what I thought was a reasonable level of performance. I think I can be happy as I did what I was asked to do." Paddy Lowe, Chief Technical Officer: "Firstly I want to congratulate Robert on his first official F1 session since he left the sport at the end of 2010. He did a fantastic job for us today, and it is a great credit to his determination and character that we have seen his return to F1. I'm only sorry that the car we gave him for FP1 was extremely difficult. But he did the very best job possible and provided valuable feedback. Overall it was not a good day. We didn't expect this to be a strong circuit for us, given the problems we've been having with the FW41 all year, but our pace is worse than we predicted. The underlying problems are understood and will be fixed in due course. On top of that we are struggling with the supersoft tyre in particular on this track. Nevertheless, we made some progress between FP1 and FP2 and I'm sure we can do much more overnight to find a better balance for qualifying and the race." Nico Hulkenberg (13th, 1:20.183): "It was a difficult quest towards balance and harmony with the car today but we definitely made progress by the end of FP2. Track conditions weren't too favourable, especially with quite a bit of wind out there. The competition is pretty tough here so we need to find a bit more pace from the car looking to qualifying and the race." Carlos Sainz (17th, 1:20.672): "It was definitely a challenging day, but we knew this could happen as in winter testing we weren't particularly comfortable in the car here. We know it's a track which requires a bit of extra work from us as a team. We have a big margin of improvement for tomorrow, especially as my FP2 fast run on the Supersoft tyres was affected by a mechanical issue, so we have some things to analyse tonight." Bob Bell, Chief Technical Officer: "It was a tricky day, where we struggled to get a good balance on the car. A lot of this was due to the wind conditions, which was difficult for the drivers, particularly where there was a tail wind on corner entry. The tyres proved tricky too, especially the Soft and Supersoft, with the Medium proving to be more solid and predictable as you'd expect. Despite two difficult sessions, both cars ran reliably and we got through our test programme with all the data we need for Sunday. The main challenge today was trying to find a good balance." Pierre Gasly (14th, 1:20.373): "Today was quite an interesting first day in Barcelona. I think this morning was a really good beginning in FP1 as we had the 10th fastest time. In the afternoon session we struggled with the car - it's really hot and windy and it looks like we suffer a bit in these kinds of conditions. It's still very tight between everyone, so we need to find some more performance for tomorrow when it's going to be even closer between the midfield. I think that If we find a few tenths we can be in the fight around P10, so we'll work hard tonight to try and get there." Brendon Hartley (18th, 1:21.265): "It was a pretty clean day, even if I lost some time in the first session after I had a trip to the gravel. For the second session we made some big changes which didn't really work, but sometimes you just have to try different thigs to figure out the right direction. We weren't very quick in the afternoon but let's keep positive, I'm sure we can pick up the pace tomorrow." Jonathan Eddolls, Chief Race Engineer: "We had fairly tricky conditions today, which was the same for everyone, as you could see there was lots of cars going off the track. A lot was due to the wind which was quite variable and gusty, and this is a track where even a small amount of wind can have quite a big effect because the corners are high-speed and quite open. In the morning with Brendon, he went off track in the first 40-minutes. It didn't really damage the car but he got a lot of stones in the cockpit, so for safety you don't want stones getting under the brake pedal, this meant we couldn't get back out within the 40 minutes which was a shame. In FP1 we focussed on setup works and mechanical setup items and some further developments on things that we tried here in winter testing. It's a very smooth track - the smoothest of the year - so you can try different setups here that wouldn't work at many other circuits, which we explored this morning. It was a fairly straight forward session for Pierre in FP1, again, it was just going through the setup work to understand more going into this afternoon. The conditions were tricky again in the second practice session. For Pierre, he ran wide at Turn 9 and damaged the floor quite heavily so we had to put a complete new floor on his car. On Brendon's first run, there was some damage to his floor which we were able to repair in the session. The mechanics did a great job to get the cars prepared so quickly but the problem was, to do all the repairs and to change the floor as well, we were late out for our supersoft qualifying run, which meant we ran into other cars that had started their long runs. We were unable to do nice, clean qualifying simulations, so I think the timesheets aren't a fair reflection of where the car is. Having said that, we're still not 100% happy with the balance of the car so there's still quite a lot of work to do overnight for tomorrow. On the long runs, both cars completed slightly shorter simulations than we had of liked because of the issues we had, but we've gathered the information and the soft tyre looks like it's behaving pretty well, we just need to go through everything and choose the best strategy for Sunday." Toyoharu Tanabe, Honda F1 Technical Director: "In general, our overall package appears to be improving compared to the last two difficult races. We have learned from the data acquired at the previous couple of Grands Prix and applied those ideas here. Although there was a slightly long stop in the afternoon for both cars, we ran without major issue and we went through the usual Friday programme. However, it was a shame that our qualifying simulation runs were spoilt by traffic, while gusty winds also made the session a bit more complicated. In tomorrow's final practice, we will focus a bit more on engine settings suitable for quick single laps, because qualifying well is very important here, as overtaking is difficult on this track." Romain Grosjean (7th, 1:19.579): "It was an okay day. It was pretty good in terms of performance and classification. It was tricky with the wind, but we've been working with different setups – some are more positive, others a bit trickier. Generally, the car feels pretty good. I'm hopeful we're going to make it even better for tomorrow and be able to go a bit faster. We're looking into what we can do, and we've got some ideas. We tried some things that we've never tried before – they worked in some aspects, but not in others. We'll change those and make sure the car's a bit easier on the entry into the corners to be able to push a bit more." Kevin Magnussen (8th, 1:19.643): "Good day today. Happy about the car performance. A few things to improve tomorrow but, generally, I think we are looking quite strong." Guenther Steiner, Team Principal: "We had two good sessions, but not completely trouble-free. Romain went off at the beginning of FP2, but we recovered the car and we got it ready to go out again. Everyone did a fantastic job. We've learned a lot and now we're ready for tomorrow." Stoffel Vandoorne (9th, 1:19.722): "It's been a pretty good Friday for us. We had a very busy schedule in both sessions, with a lot of things to figure out across both cars, so it was pretty intense for the team but everything was very well-managed. The first feeling was positive today – it's still too early to read anything as the midfield still looks really tight, but I think tomorrow will be the day that counts. The tyre compound selection also won't be an easy decision to make. The conditions were very tricky out there and we saw a lot of mistakes on track, but we all had to deal with the same things and I felt okay in the car. Tomorrow, every tenth and every little bit of performance we can squeeze out of the car will be important for qualifying. It will be up to us to put everything together. The results today looked quite promising, but until we've pushed everything to the limit we won't know exactly where we are. We need to understand everything we've learned today, put the car in the best specification possible and see what result it brings. I hope this is the start of continuous progression, and that we can build our season from here." Fernando Alonso (12th, 1:20.035): "Seen from the inside, the upgrades we brought here are a step forward. There is more performance in the car – it felt better and there was more grip. Conditions were tricky today with the hot temperatures and especially the wind; we saw a lot of people going off track and I think it's going to be the same tomorrow. It has been a positive Friday and we've tested everything we brought here. There's still some debate about some of the parts, but we seem to be a little bit more competitive here than any of the other Fridays this season. We'll have a clear reference tomorrow about how much we have really improved compared to everyone else. It's going to be cooler and there's even a threat of rain forecast for Sunday. We possibly have a chance to make it into Q3 tomorrow, so let's try and maximise that." Eric Boullier, Racing Director: "Today's practice sessions were always going to be about spending solid time testing the various new components we have brought to Spain this weekend – and that's exactly what we did. We completed a lot of useful mileage and conducted a number of comparison and correlation tests to evaluate their performance and send the data back to the factory. Overall, we're satisfied with today's work. Naturally, the more you test, the more data you have, and therefore the more number crunching there is to do. So, we'll be busy this evening analysing the information – not only to determine the programme for tomorrow, but also to help inform our development plans for the coming races." Marcus Ericsson (15th, 1:20.501): "It was a positive day for us today. We tested some new aerodynamics parts on our cars, and worked with different tyre compounds. We were quite competitive on the soft tyres, and were running within the top ten. After changing to the softer compound, we struggled a bit to improve the lap times. We have some work ahead of us here in terms of tyre management. If we find a way to make a jump with the softer tyres, we should be doing well tomorrow and on Sunday." Charles Leclerc (16th, 1:20.514): "It was a good day overall. We completed different tests, and set up the car to suit the the Circuit de Barcelona-Catalunya layout. Our performance is better than expected for this type of track, which is a good sign. It shows us that we have made good progress since the winter tests at beginning of season. We have to continue to work hard now and continue making improvements throughout the weekend. I look forward to tomorrow's sessions."